AMMAN - “All 4 Palestine” Society, one of Talal Abu-Ghazaleh Global (TAG.Global) initiatives, announced that the stories of 6000 Palestinian innovators and achievers from all around the world were featured on its website (All4Palestine.org). The “All 4 Palestine” website tells the story of every Palestinian scientist, writer, actor, official, comedian, athlete and businessman who, through suffering and hardship, achieved success, serving as role models to the young generation. 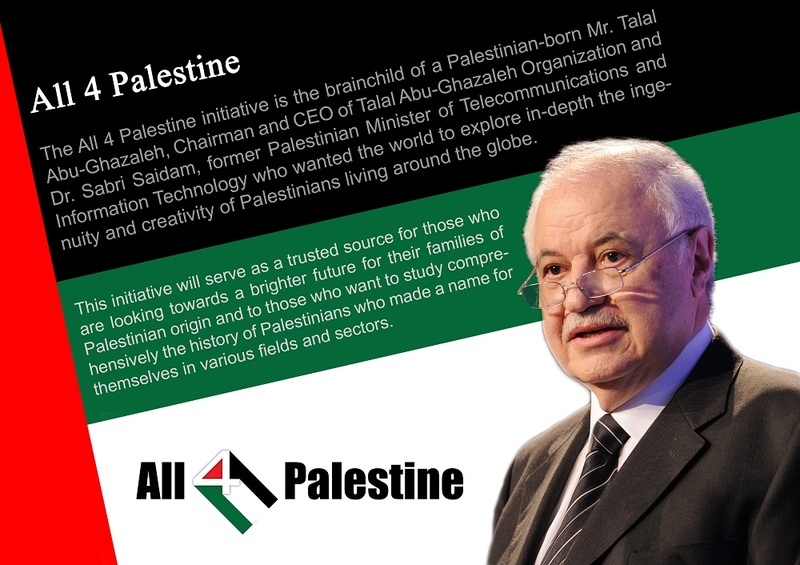 HE Dr. Talal Abu-Ghazaleh stressed that "All 4 Palestine’s mission has nothing to do with politics and its main goal is to tell the world the stories of creative Palestinians, their role, creativity and contributions in the countries where they live and their positive effect on the human civilization”. Furthermore, Dr. Abu-Ghazaleh highly praised the role of Palestinian Minister of Education, HE Dr. Sabri Saidam who is one of the Society’s founders and a member of its Board of Directors. Dr. Abu-Ghazaleh explained that the Society’s website is a reliable source of information for the next generation and for those who seek to conduct a comprehensive study about the history of Palestinian achievers in various sectors and fields. The mission of “All 4 Palestine” Society is to become a comprehensive source showcasing the incredible stories of Palestinian achievers and the inspirational influence they have made, and continue to make in fields as diverse as science, academia and business to comedy, sport and politics. Dr. Abu-Ghazaleh added that the Society has benefitted from the latest developments in technology to promote its mission on a wide scale by converting its website into a mobile application to enhance the access to the largest number of Palestinian creators without any complications. It’s noteworthy to mention that All 4 Palestine, founded in 2011, is a non-profit and non-political society that aims to shed light on the impact of Palestinians on human civilization, document and highlight the names of a number of Palestinian women and men from around the world who contributed mainly in scientific, cultural and economic development of humanity.